B.1 What Is the Cg Runtime? Compile the programs for the appropriate profile. This step translates your Cg program into a form that is compatible with the 3D programming interface used by the application and the underlying hardware. Link the programs to the application program. This step allows the application to configure the program for execution, and to feed it varying and uniform parameters. You can choose when you want to perform these operations. You can perform them at compile time, when the application program is compiled into an executable, or you can perform them at runtime, when the application is actually executed. The Cg runtime is a set of application programming interfaces (APIs) that allows an application to compile and link Cg programs at runtime. B.2 Why Use the Cg Runtime? Most applications need to run on a variety of GPUs with various levels of functionality, so these applications need to run on a variety of profiles. If an application precompiles its Cg programs (at compile time), it must store a precompiled version of each program for each profile. Although possible, the precompiled approach is cumbersome for an application that uses many Cg programs. What's worse, the Cg programs become frozen in time. By precompiling Cg programs, an application sacrifices the optimizations that future compilers could offer. In contrast, Cg programs compiled by applications at runtime benefit from future compiler optimizations for existing profiles. And these programs can run on future profiles corresponding to new hardware and 3D API functionality that did not exist when the application's Cg programs were written. Register names cannot be easily matched to the corresponding meaningful names in the Cg program without looking at the compiler output. Register allocations can change each time the Cg program, the Cg compiler, or the compilation profile changes. This means you would have to update the application each time as well, which would be inconvenient. In contrast, linking a Cg program to the application program at runtime removes the dependency on the Cg compiler. With the Cg runtime, you only need to alter the application code when you add, delete, or rename Cg input parameters. The Cg runtime also offers facilities to manage the input parameters of the Cg program. In particular, it makes data types such as arrays and matrices easier to deal with. These additional functions also encompass the necessary 3D API calls to minimize code length and reduce programmer errors. 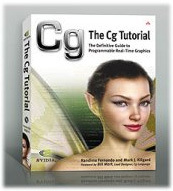 B.3 How Does the Cg Runtime Work? Figure B-1 shows the three libraries that make up the Cg runtime API. A core set of functions and structures encapsulating the 3D API–independent functionality of the runtime. An OpenGL-specific set of functions built on top of the core set. A Direct3D-specific set of functions built on top of the core set. To make it easier for application writers, the OpenGL and Direct3D libraries each adopt the philosophy and data structure style of their respective APIs. You need only link with the 3D API–specific Cg runtime library for the 3D API your application uses. Therefore, most applications use either the OpenGL or Direct3D Cg runtime library. The rest of this appendix provides code fragments, written in C, for using the Cg runtime in the framework of an application. Each step includes source code for OpenGL and Direct3D programming. Functions that involve only pure Cg resource management belong to the core runtime and have a cg prefix. In these cases, the same code is used for OpenGL and Direct3D. When functions from the OpenGL or Direct3D Cg runtime libraries are used, notice that the API name is indicated by the function name. 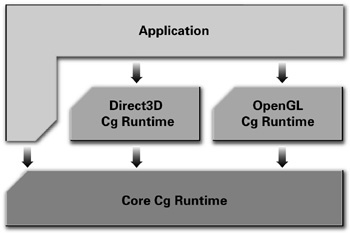 Functions belonging to the OpenGL Cg runtime library have a cgGL prefix, and functions in the Direct3D Cg runtime library have a cgD3D8 or cgD3D9 prefix, for DirectX 8 and DirectX 9, respectively. In the examples that follow, we show the DirectX 9 versions of the examples. Replacing " D3D9 " with " D3D8 " will produce the DirectX 8 versions of the same examples. Note that the functions we list here take the same parameters in DirectX 8 and DirectX 9. In general, this is not always the case. A context is a container for Cg programs. It holds the Cg programs you load, as well as their shared data. The CG_SOURCE parameter indicates that the following string argument, programString , is an array of bytes containing Cg source code, not precompiled code. The Cg runtime does let you create a program from compiled code (called object code) by using the CG_OBJECT rather than CG_SOURCE parameter, if you want to. profile specifies the profile for which the program will be compiled—for example, CG_PROFILE_ARBVP1 for OpenGL applications, or CG_PROFILE_VS_2_0 for Direct3D applications. The main string parameter gives the name of the function to use as the entry function for your program. Finally, args is a list of strings that supplies options to the compiler. After you compile a program, you need to pass the resulting object code to the 3D API that you are using. For this, you need to invoke the Cg runtime's 3D API–specific functions. You must do this every time a new Direct3D device is created, typically only at the beginning of the application. vertexDeclaration is the Direct3D vertex declaration array that describes where to find the necessary vertex attributes in the vertex streams. myParameter is the name of the parameter as it appears in the program source code. The second step is to set the parameter value. The function used depends on the parameter type. These function calls assign the four floating-point values contained in the array value to the parameter myParameter (assumed to be of type float4 ). In both APIs, there are variants of these calls to set matrices, arrays, textures, and texture states. In Direct3D, nothing special needs to be done to enable a specific profile. Next, you bind the program to the current 3D API state. This means that it will execute, in the subsequent drawing calls, for every vertex (in the case of a vertex program) and for every fragment (in the case of a fragment program). You can bind only one vertex and one fragment program at a time for a particular profile. Therefore, the same vertex program is executed as long as no other vertex program is bound. Similarly, the same fragment program is executed as long as no other fragment program is bound. Disabling a profile issues commands, based on the profile, to return OpenGL to its fixed-function mode. Note that destroying a context destroys all the programs it contains as well. In this mode, many helpful messages and traces will be output to the debug output console.